An Emergency Operations Center (EOC) is a specially designated centralized facility where officials meet face to face to coordinate a jurisdiction’s overall disaster response and recovery efforts in support of field operations. Every U.S. state, most cities, counties, tribes, major employers, military installations and health care facilities have an EOC. While the size, complexity and types of EOCs vary by organization, they all perform the same basic functions. Our EOC is designed to facilitate the efficient response to a wide variety of human-caused, natural and technological hazards and disasters that can potentially impact the UW’s mission. 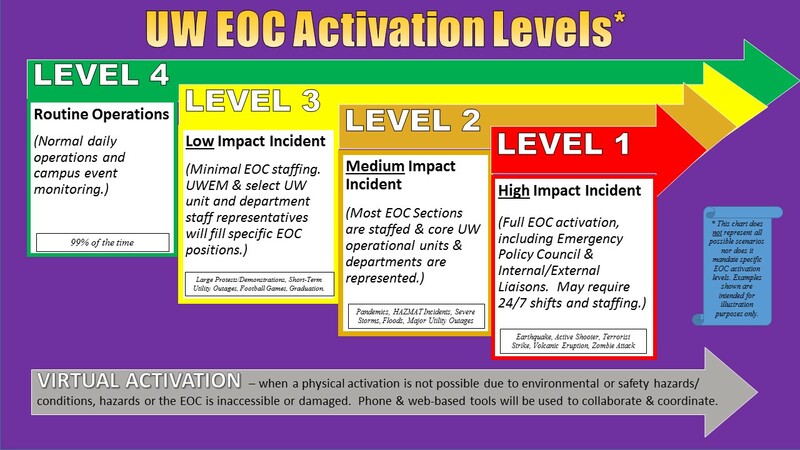 The mission of the UW’s EOC is to minimize the impact of emergencies and disasters to the campus community through coordinated planning, information-sharing and resource management between University departments/ units, partnering agencies and the public. On June 29, 2011, UW Today published an article about the opening of the Emergency Operations Center at the UW. Where is the UW’s EOC? The UW actually has three separate EOCs! Our primary EOC is located in Suite C-140 of the UW Tower complex. In addition, the university maintains a primary alternate EOC at Poplar Hall as well as a mobile off-site command vehicle maintained by the UW Police Department. The primary EOC has seven rooms: The main operations room, UWEM staff workstations, media and communications room, UWEM director’s office, secure conference room, storage and the emergency policy room. Totaling more than 5,500 square feet, the EOC provides space for the UW’s decision-makers to provide guidance and support to the rest of the campus to ensure rapid and efficient disaster response and recovery efforts. Why is the EOC located at the UW tower? We moved out of the old 100+ year-old Bryant Building in February 2011 to the UW Tower to ensure that the UW would be able to effectively and rapidly respond to any type of crisis, emergency, disaster or catastrophe after a major disaster. The new EOC is located in a building that has received a significant amount of seismic (earthquake) retrofitting, as well back-up emergency generator power, communications and HVAC in case of power outages. As part of a regional partnership agreement, the EOC acts as the -primary back-up to the city of Seattle’s downtown EOC in the event that their facility is unavailable or damaged. How was the EOC funded? The UW capital projects budget funded the actual structure and floor space. However, nearly 100% of the equipment, supplies, communications and audio-visual equipment was funded via a variety of federal (FEMA and U.S. Homeland Security Department) grant sources in 2010.
Who works in the EOC? While the EOC is staffed Monday-Friday by the three full-time UW Emergency Management Department employees (who are co-located in the facility), the EOC can comfortably seat up to 90 university officials and external partners (city, county, state, FEMA, National Guard, Red Cross, etc…). The EOC is organized using the nationally mandated Incident Command System, or ICS. Under this system, which we train on every year with every EOC responder, the UW ensures that we follow the same decision-making structure that is used by every other government unit in the U.S. Our University’ s disaster plan describes how this system works. Is it “all-or-nothing” when the EOC is activated? on the disaster, crisis or incident, we have the flexibility to ramp up the level of activation all the way up to Level 1. More than just a a “Bad Hair Day,” a Level 1 activation is generally reserved for the real big and bad disasters such as an earthquake, active shooter or a blimp filled with toxic zombies crashing in the middle of Red Square during finals week! Our EOC activation levels are now consistent with the same classification system used by our State, County and City partners. What happens in the EOC when there is no disaster? The EOC is used five days a week for disaster drills, emergency training, meetings, orientations, seminars and other public information and education events. In order for the EOC to be tested on a regular basis, UWEM staff encourages its use and operations on a regular basis to ensure that all systems are fully operational for the “real thing” when disaster strikes. Please contact UWEM at 206-897-8000 if you would like to schedule a tour, training or orientation for your group or department. We have over 55 phones, six fax machines, 20 UHF/VHF & 800Mhz radios and even a satellite phone! However, the best way to contact the EOC (when it is activated) is to call the main EOC Switchboard number at 206-897-8800. Are you an EOC responder? Do you need access to our online incident system? After years of trial-and-error and experimenting with a number of commercial off-the-shelf software and online database systems, the UW officially adopted the use of streamlined and simplified online virtual EOC system for use by our EOC responders, stakeholders and key internal/external partners. Developed initially by a UWEM graduate intern in 2015, this online Google-based system has been refined and updated to meet the ever-changing needs of our disaster planning and response community, We call this system vEOC (short for virtual Emergency Operations Center). Access to the system is controlled via a secure password-protected system. ARE YOU AN EOC RESPONDER & NEED TO LOGIN TO vEOC? Click HERE.